SHOP HOME > BABY baby shower,birth,christening/holy communion > PINK FOR A GIRL! Lovely personalised hand decorated favour boxes with a cross motif on the top. 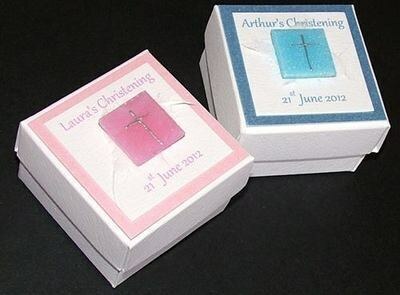 Perfect to add your own gift for a christening, new baby or baby shower. Please type in the freetext box below what personalisation you would like on your box. Any questions placing your order please contact us via our "live chat" facility or e-mail us on info@itsawrapcornwall.co.uk.